The report includes over 950 letters from assorted cranky Peninsula NIMBYs, hippies, and Howard Jarvis looking Ayn Rand worshippers demanding that the high speed rail project be squashed underfoot like a pesky insect. That, or the rail authority should put the train in a tunnel all the way down the Peninsula from San Francisco to San Jose, because, you know, that would be like cost effective and practical and everything. So, have a look at the document and post your thoughts in the comments. I'll have a fuller analysis on this either tonight or tomorrow. The US Congress is getting a reputation as the place where good ideas go to die. Although currently held by the Democratic Party, the real power lies with center-right Democrats who are generally skittish about significant change, and certainly wary of either spending money, finding new revenues for programs, or both. We can see this in the health care and the climate change bill - but we can also see it in the discussion of the reauthorization of the Transportation Bill, due in 2009. In the House, Jim Oberstar has been pushing to produce a bill that would better fund public transit and shift the government's priorities away from roads and sprawl. Transportation for America has an analysis of his efforts here - it's a mixed bag so far. In 2001, knowing the next highway reauthorization was set for 2003, we developed a six-year funding mechanism that called for a 2-cent-a-gallon gas tax increase in the first year, a 2-cent-a-gallon increase in the third year, and another 2-cent-a-gallon increase in the fifth year. As I recall, that would have been a $330 billion proposal and left us with a $7 billion unobligated trust fund balance after six years. We went to the Oval Office, and after we went through the entire presentation, President Bush takes a marker, circles the gas tax increases, and says, "Norm, I don't want any of those tax increases. Get those out." So we went back and put a CPI inflator on the gas tax in the fifth year. Keep in mind that the gas tax had not been raised since 1993. We returned to the Oval Office, went through the presentation, and afterward President Bush said, "Norm, that's a tax increase. Get that out." I wholly agree with these statements, and it is certainly time to provide general fund support for transportation projects. Infrastructure, especially mass transit infrastructure including high speed rail, is at the center of this nation's economic recovery effort and our 21st century prosperity. Unfortunately, Congress seems to have totally abandoned any interest in economic recovery or long-term planning, and is instead dominated by obsolete 20th century concerns about the politics of taxes and user fees. Barbara Boxer's reluctance to propose revenue solutions, and her desire to kick the can down the curb, is part of a growing trend in her approach to policymaking that is much more risk-averse and centrist than we are used to seeing from the more liberal of our two senators. Facing re-election in 2010, Boxer appears to have concluded that she needs to play to an assumed political center, seeking bipartisanship (with James Inhofe? ha!) and avoiding anything resembling a tax increase for fear of how it would play with California voters. These concerns are misplaced. Californians have shown they will support raising revenue for sustainable transportation solutions, as the November 2008 election made clear. Not just in the passage of Prop 1A, which after all was a bond, but in the passage of outright sales tax increases in Los Angeles, Santa Clara, Marin and Sonoma counties. Those counties have nearly 15 million residents, and over 67% of voters in those counties supported the concept Yonah Freemark described above, of asking everyone to subsidize mass transit, not just those who use it. Boxer's unwillingness to lead is sadly being matched by President Barack Obama. Over the first six months of the Obama Administration a disturbing trend has made itself clear. Obama likes to talk a big game, and will make public statements promising a new era, broad reform, and an embrace of policy change. He then leaves all the details up to Congress, refusing to get involved in the nitty gritty of the negotiations. As a result Congress's natural tendency to either do nothing or do the wrong thing is asserted, and we get outcomes like an 18-month postponement. How this affects HSR is unclear. High speed rail will be a part of the new Transportation Bill. How it will be funded remains totally unclear. Obama wants to see a long-term HSR program come out of Congress, but as with so many other aspects of his agenda, Obama is going to have to learn that if he wants Congress to do something, he is going to have to force the issue and make it happen himself. Until Obama does, the US Congress will remain a graveyard for common sense and smart, proven, effective policy. Back in the USA after two wonderful weeks in Portugal. There was a fair bit of HSR news while I was over there - the ruling Socialist Party made the surprising announcement that the final decision to move ahead with the planned HSR line to connect Lisboa to Madrid was going to be postponed until 2010, after this year's legislative elections. The PS and its prime minister, José Sócrates, are worried about losing to the rival Social Democrats (PSD), who are not exactly strong supporters of the line even though Portugal and Spain have signed agreements to build it, and even though the EU has already planned to contribute financially to the project. The PS wants to make the PSD look uninterested in solving the economic crisis, and Sócrates seems to think that making an election issue out of the HSR project would give his party a boost, as the proposal is generally popular with the public, and Portugal doesn't have to foot the entire bill. But the nakedly political ploy could well backfire. The EU was not pleased with the postponement, and Portugal's president, Aníbal Cavaco Silva (of the PSD), had to step in to ease concerns and promised that the project would still go forward. News reports spun it as a sign of weakness on the part of Sócrates and the PS. So we will see what happens. I'm still getting over jet lag, so use this as an open thread. Tomorrow I'll be back to discuss our own HSR project here in California. It´s mid-afternoon here on the Algarve in Portugal. Beautiful weather, cool clear water, and a nice breeze making the last week of my visit here quite enjoyable. So what am I doing online? Other than being a total nerd, and taking a kind of siesta, I´m catching up on HSR stuff. Thanks so much to Rafael for his ongoing work in keeping the blog updated. AB 153 by Fiona Ma will be heard in the Assembly Transportation and Housing Committee today - the bill would clarify the eminent domain power of the CHSRA, to emphasize the agency does indeed have such power. Apologies if this has been discussed before - it is a few days old - but the Mercury News has an article on two Menlo Park/Atherton moms who have organized to fundraise for the anti-HSR lawsuit, having collected over $30,000 (note: the original version of this post misstated the sum as $300,000) toward the legal bills. I´m really pleased to see that in this economic crisis there are people with that much money to waste, especially mothers who apparently don´t have to worry about the severe attacks on public education taking place in this state. Wouldn´t $30,000 be rather useful to local schools or to help feed the hungry?! A new High Speed Commuter Train enters service in the UK today. Traveling at a top speed of 140mph, the Japanese-built "Javelin" is extremely light (for a train) and equipped with powerful electric motors. These permit rapid acceleration and deceleration such that the service can share the expensive HS1 tracks with Eurostar, whose trackage fees on the UK side have long been 10 times higher than in France. This is oneI reason why tickets are so much more expensive than those for similar distances within France. The new regional HSR service should reduce Eurostar's costs in the UK. For more on the concept of running both long-distance and purely regional HSR trains on the same tracks, see also our earlier post on "HiSpeed Services And Branding". Meanwhile, Greengauge 21, a prominent HSR advocacy group in the UK, warns that the government's proposed top speed of 250km/h (155mph) for HS2 (the extension to London Heathrow, Birmingham and Manchester) will be insufficient to attract enough ridership. For the extension to be a commercial success, it claims the line will need to support top speeds of at least 300km/h. VIA Rail, Canada's counterpart to Amtrak, wants to upgrade service to 125mph in the core Windsor-Quebec City corridor. This could eventually connect to the Midwest HSR network that proponents think was given a boost by the FRA guidelines published yesterday since it will eventually link eight US states. However, much like the hoped-for Pacific Northwest link between Vancouver BC and Portland (perhaps Eugene), there are simply no public funds on the table. Prime Minister Stephen Harper, a conservative, remains opposed to improved passenger rail service in his country. In addition, the Canadian border agency is demanding C$500,000 per year to man the new border post at the train station in Vancouver. This was enough to derailed the effort to get at least the Amtrak Cascades route extended. JR East has officially unveiled its new E5 series trains, which will serve the Tokyo-Shin Aomori route at a top speed of 320km/h (199mph) starting in 2013. The advanced active-tilt design will run on the existing Tohoku shinkansen line, which was built for a much lower top speed decades ago. While the Fastech 360 development platform for the E5 did achieve the desired top speed of 360km/h (224mph) on the same tracks, it failed to meet very ambitious targets for noise emissions and emergency braking distance. The signature retractable air brakes are not needed at the lower top speed defined for the E5 and were therefore cut from the final design. A new report on the Jerusalem-Tel Aviv HSR line in Israel has uncovered cost overruns and inadequate planning in a key section. It seems likely that heads will roll in the agencies responsible. Yesterday, San Jose Mayor Chuck Reed and San Francisco Mayor Gavin Newsom issued a joint press release announcing the Bay Area region's preference for stimulus and other HSR spending the Bay Area to be directed towards upgrades to the Caltrain corridor, the expansion of SJ Diridon Station, and the establishment of the new SF Transbay Terminal as the SF terminus. Newsom had already come out in support of Transbay. Enhancing Diridon was a foregone conclusion. But the announcement apparently portends a broader regional agreement. The proposal would turn the Diridon Station in downtown San Jose and the planned new Transbay Terminal in downtown San Francisco into major regional transit hubs. In addition, the Caltrain Station at Fourth and King streets in San Francisco's South of Market would be expanded to accommodate high-speed rail. The proposed package also seeks funding to electrify Caltrain and to equip its rail cars with automated train-control equipment that senses impending danger on the tracks. The train tracks in San Bruno would be separated from truck and auto traffic. Together the projects would cost $3.4 billion, said Randy Rentschler, government affairs manager for the Metropolitan Transportation Commission. The region will ask for $1.6 billion in new federal stimulus money to help pay for the improvements. 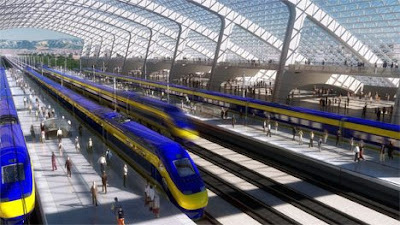 Additional funds would come from the nearly $10 billion funding pot backed by California voters for high-speed rail. The Bay Area will seek additional funding later to pay for other projects. It's encouraging to see a regional consensus emerging around Transbay, which should hopefully end the public political squabbles. What do you think? Will this announcement put an end to the issue, or merely galvanize opposing forces and bring the funding and technical challenges of Transbay further into the fore? At a study session, council members discussed outreach efforts for high-speed rail and whether it should join the Peninsula Cities Consortium. The consortium currently includes Palo Alto, Menlo Park, Atherton, Burlingame and Belmont — cities that have been largely critical of the authority's plans for a major high-speed train running through the state. Though no formal vote was taken, a small majority of the seven council members — including Mayor Margaret Abe-Koga and Council Members Tom Means, John Inks and Mike Kasperzak — said they were hesitant to join the consortium at this time. Though consortium cities don't have to follow any particular viewpoint and are free to disagree with the other cities, Mountain View council members said they would rather stay independent. "I'm not necessarily sure I want to have my voice drowned out or watered down by the other cities," Abe-Koga said. The current member cities share essentially the same opinion of high-speed rail, Means said, and Mountain View would likely be outvoted on controversial issues. Reading between the lines here, it sounds like Mountain View doesn't want to get locked into an anti-HSR NIMBY position as is being advocated by the Peninsula consortium. Good for them! It's nice to see cities along the Caltrain/HSR line understanding and welcoming the benefits of electrified, fast passenger trains, instead of blithely assuming in the face of all available evidence that the status quo is just fine and doesn't need to change; or assuming that there will magically appear the money to tunnel from Bayshore to Mountain View. Not everyone on the Mountain View city council agreed with the inclination to stay out of the consortium, but even those who suggested the city participate did so out of a "rather be inside the tent than outside" mentality. Still, I think the opponents of joining the consortium have it right. That Peninsula consortium has no real useful or productive purpose and is headed down a blind alley. They don't want an above-grade solution, but they are unwilling to admit the reality that a tunnel will cost too much money. So they'll ultimately be stuck fighting over whether to oppose the whole Caltrain/HSR project or whether to support it, instead of offering constructive feedback. If that was the goal of the consortium - to explore ways to integrate an above-grade solution with the Peninsula corridor communities in the most effective ways possible - then the consortium would have a lot of value. But we all know that isn't its purpose. Mountain View is better off talking directly with the CHSRA, instead of wasting time on a consortium that is not likely to produce any productive outcomes given its current attitudes and composition. I'm headed to Portugal for two weeks this coming Thursday and am spending the day getting my preparations done. Our trip will take us all over the country, from Porto to Coimbra to Lisboa to Faro and the Algarve (where I'm hoping it won't yet be totally overwhelmed with British tourists). Not only will it be representative of the various regions of Portugal, but it's a trip that can be done via high speed rail. Comboios de Portugal operates the Alfa Pendular, a tilting train of the pendolino family. The trains have a top speed of 220 km/h (136 mph) which isn't exactly TGV or AVE speed, but certainly qualifies as a kind of HSR. It connects Porto to Lisboa (the nation's two largest cities) in about 2 hours. So I'll get to see the Portuguese HSR system in action, although before the planned upgrades of the Porto-Lisboa line to 300 km/h (to be completed by 2015) and before the HSR link from Lisboa to Madrid is completed (due in 2013). The FRA presentations from the Sacramento meeting have been posted online (h/t to Matt Melzer). Haven't yet had a chance to look these over, but if you do, be sure to offer your thoughts in the comments. 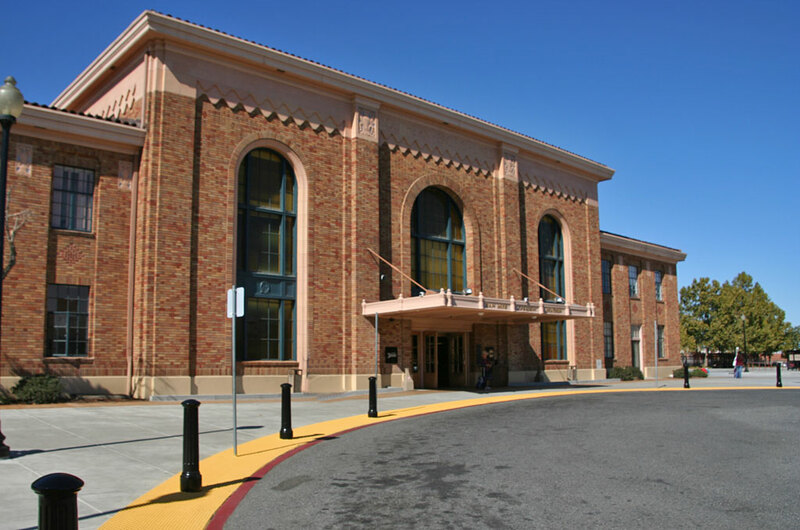 The Bay Area Council Economic Institute has proposed $7 billion in infrastructure stimulus for the region, including HSR-related projects such as upgrading Diridon Station. The board took no action on the $99.4 million budget plan Thursday - that will come later this month or early next month - but voted unanimously to declare a fiscal emergency. That move allows the transit agency to bypass state environmental reviews and enact service cuts and fare hikes at an accelerated pace. The decision follows similar ones by BART, SF Muni and AC Transit in the East Bay. Squeezed by cuts in the state budget, reduced commuter ridership and lower sales tax revenues at the county level, all of these bureaucrats essentially have no choice but to increase revenue and/or cut services to plug rapidly expanding holes in their respective budgets. Down south, Metrolink is also raising fares, but LA Metro will maintain both fares and service levels in FY2010. Indeed, it boasts of service enhancements, even as it cuts expenses by $130 million and taps into reserves. Note that many of these "enhancements" are actually cuts in selected bus routes. NCTD also intends to maintain both service levels and (most) fares in the coming fiscal year, having already implemented cuts and fare hikes in the current one. 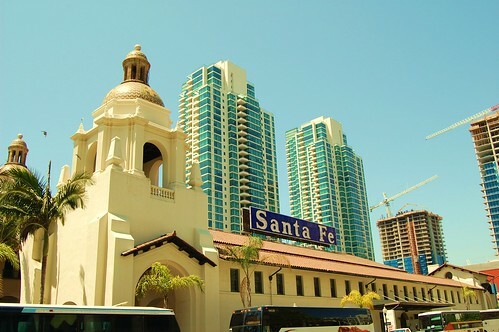 MTS in San Diego has passed a framework budget but warns of further cuts to come as it fills in the details. The mixed picture suggests that Southern California, long considered a bastion of the automobile, now actually has a mass transit network in better fiscal health than the Bay Area. However, the reprieve will only be temporary if the recession last longer than expected. Amtrak California aka Caltrans' Division of Rail is funded by the state of California, which is all but bankrupt. Since voters rejected a delicate compromise in a complex package of propositions put to them last month, chances are subsidies for the Pacific Surfliner, Capitol Corridor, San Joaquin may well be slashed severely in coming weeks as lawmakers in Sacramento figure out how to balance their budget through cuts alone. Unfortunately, while service cuts and/or fare increases are required at multiple levels in the short term, they also set in motion a vicious circle of ever-decreasing ridership and ever-greater traffic on the state's highways. That's exactly the opposite of what is required for a sustainable recovery and population/economic growth in the long term. Of course, California is hardly alone in its budget woes, but very few states require a 2/3 majority to pass a balanced budget. Considering its population now exceeds that of Canada, which requires just a simple majority, perhaps it's time to admit the obvious and amend the pertinent sections of the state constitution in 2010 such that the change is hard to reverse. You can either have high taxes and high-quality public services (e.g. dense transit networks at multiple distance scales) or, low taxes and few public services. The other permutations are simply not sustainable, there is no tooth fairy and also no prospect of reasonable compromise. Having sole authority and responsibility for balancing the budget tends to concentrate the minds of politicians on both sides on drafting feasible, coherent multi-year policies instead of engaging in ideological trench warfare. In addition, there could well be a drop in the number of spending decisions taken via single-issue ballot propositions, especially expensive ones without a dedicated revenue stream. And yes, while I am in favor of California HSR, I do believe direct democracy was a bad way to get it off the ground. Such mega-projects ought to be proposed and promoted not by bureaucrats but by elected officials who are directly accountable to the people. Meanwhile, Secretary of Transportation Ray LaHood is trying to plug a hole of his own in the federal highway trust fund. With healthcare and electricity infrastructure high on the President's domestic agenda, it is possible the next major transportation bill won't be passed before the 2010 midterm elections. For now, expect Congress to kick the can down the road, i.e. to take on more debt rather than raise federal fuel taxes, a concept that is widely perceived as politically impossible. Then again, so was electing an African-American POTUS a couple of years ago. However, at some point, both the state of California and the Obama administration will have to reconcile their lofty ambitions of green energy and transportation systems with the hard reality that investments in such infrastructure will only pay off if perpetuating the status quo becomes prohibitively expensive for private businesses and consumers alike. No pain, no gain. Both should cut other taxes if and when they can, but they really need to ramp up those on petroleum-based fuels to gradually reduce total vehicle-miles traveled per capita, to partially shield consumers from oil price volatility and, to boost the utilization rates of fixed-cost transit infrastructure (incl. bicycle paths). Ironically, sharply higher gas prices are also exactly what the domestic auto industry needs to increase profits per sale after it sheds excess unit volume capacity in the context of its present restructuring effort. GM in particular is risking the farm - soon to be your farm - on its expensive E-Flex architecture, essentially electric drive with an "emergency" generator to extend the range. Meanwhile, HSR already has a proven track record of returning operating surpluses after an initial ramp-up period, overseas and even in the Acela corridor. There is every reason to believe it will thrive without annual subsidies and perhaps even cross-subsidize local and regional connecting transit operations. In the long run, HSR will prove a far superior investment to paving over ever more land with asphalt, precisely because it promotes an alternative to land development patterns that rely on cheap oil while creating additional new opportunities for the US manufacturing sector. Though California is in the throes of a budget crisis, Vice President Joe Biden said Wednesday that the state's high-speed rail project is well-positioned to compete for a significant share of the $8 billion that the Obama administration set aside in the American Recovery and Reinvestment Act for rail lines. ..."The reason why California is looked at so closely -- it's been a priority of your governor, it's been a priority of your Legislature, they've talked about it, a lot of planning has been done," Biden said in a conference call with reporters. 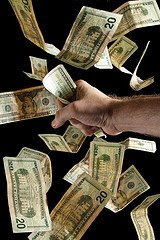 The vice president said the administration wants "to get shovel-ready projects out the door as quickly as we can. . . . So California is in the game," he said. This reinforces Ray LaHood's previous comments that CA is going to get a ton of HSR money from the federal government. Again, we don't quite know how much, but the amount is likely to be significant. There was some debate back in 2008 and early 2009 about whether the promised federal commitment to HSR would actually materialize. Clearly, it has. Obviously that needs to be an ongoing commitment, and that is where the battle over the 2009 Transportation Bill will become so important. But with Barack Obama, Joe Biden and Ray LaHood, we seem to have the right team in place to ensure that the feds will follow through on HSR.